PingPong is becoming quite the young adult of a turtle and I'm having to come to grips with the fact that my sweet boy is growing-up. Every morning, I feed him his first piece of food from my fingers. He's come to expect this ritual and won't start looking around for all the other food floating in the water until he reaches for the piece from me. Since we've moved to Arizona, PingPong has grown about an inch in length and in shell diameter. He's getting bigger and much stronger. Now, when I feed him in the morning I have to be careful as his little nips have turned into full-jaw-assault-clamps on the fingernail. I think if I had just a little bit bigger piece of food, our problem would be solved. Unfortunately, he only eats turtle pellets. Perhaps there is a gourmet turtle food out there, one that has all kinds of real brine shrimp and mealworms that would be bigger than the Reptomin. I think the best treat you can give a turtle is an inchworm fresh off the basil plant. I don't think inchworms live in the desert. I love grits. I've always had an affinity for them, but lately it's turning into an obsession. Last night, I served them as a side dish with dinner. Zack was perplexed but, like a good yankee, he stoically endured. Actually, I think he kinda liked them. For those who are unfamiliar with grits let me give you a little history. Grits are stone-ground hominy. Hominy is a weird derivative of corn. Dried corn get soaked in an alkaline substance (like lye-water from wood ash) which dissolves the hard-to-digest outer skin of the kernel. What's left behind is the fluffy inner-goodness that is hominy. Big hominy is soaked to make pasole (glorious Mexican stew), if not it's ground into grits, or it's ground even finer to make dough for tamales tortillas. Most often, grits are served straight-up with butter. I prefer them with a little cheddar cheese mixed-in, but then again, I like cheese on everything. Some people like grits & gravy or grits & ketchup. Grits provide an excellent bed for spicy shrimp or other saucy seafood. Lately, I've grown accustomed to adding a little brown sugar and butter to my grits in the morning. I can't say enough about grits really. If you haven't tried them, I sincerely hope you will. They are quick, easy, healthy, and so good! I stole this clever little MeMe from Ari. Enjoy! Accent: New Englander meets Southern Bell with a sprinkling of Western PA. Translation--no accent, I just pronounce some words funnylike. Booze: I'm a beer snob, my favorites being Smuttynose and Sierra Nevada. I also love me some Grey Goose. I'm a wine fan and whiskey fan. I guess that's a yes on the booze. Chore I Hate: Doing dishes. And, cleaning out PingPong's tank--there's nothing worse than the algae/turtle poo goo that comes out of that thing. Favorite Perfume/Cologne: Love's Babysoft, Elizabeth Arden's Green Tea, RL's Beautiful, anything light and natural or coconutty. Gold/Silver: Usually silver but I don't discriminate amongst the precious metals. Hometown: Good Question--lately it feels like Portsmouth, NH though I'm not really from there. Insomnia: I can fall asleep almost anywhere. Kids: One day, in a galaxy far, far away I will have a gaggle of adopted babies. Number of Sexual Partners: Nice try. Time I usually wake up: Depends on when I went to bed. X-Rays: I've had a few, in the arm and ankle area mostly. Yummy Foods I Make: I make a million things--current favorites include red chili pork chops, quinoa & black bean salad, stuffed artichokes, and chai smoothies. The continuous churning of the escalator, the waves of travelers rushing to fetch their bags, the cart stand, Starbucks, and signage. I'm about to call the airport home. In the past two weeks I've spent time at Phoenix, Bakersfield, Santa Barbara, LA, and Boston airports. Currently, I'm stranded at Logan. I spent the weekend in NH visiting friends, living a life a I cherish more and more every day. I forgot what it feels like to be in a house full of people you absolutely adore. There is nothing I like more than being completely surrounded by the people with whom I am most at home. It rained all weekend, there was not a dry moment to be had. Apparently it's been raining here for days and days. 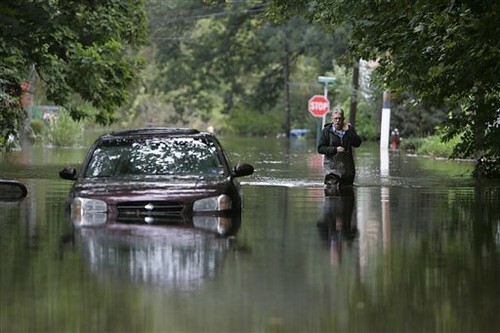 The flood waters are rising rapidly and there's no end in sight. It was a trip this morning, coming into Boston and seeing so many roads washed out, fields turned into lakes and rivers out of control and exponentially large. I guess missing my flight this morning and being trapped at the airport for 8 hours isn't such a travesty after all. At least my home is warm and dry, albeit a little too warm and dry (current temperature is 101), but safe and in tact nonetheless. My prayers are going out to all the displaced people and the homeowners carrying bucketloads of water out of their basements! There are not enough hammocks in the state of Arizona. It's probably due to the lack of trees. Cacti are tall but not very sturdy. While they can range from about 15 to feet in height, their root systems are as shallow as they come. I certainly wouldn't want to temp the 1 ton weight of a juicy cactus while napping in the Arizona sunshine. Saguaros are also quite prickly (duh) and not as easy to cosy-up to as a big oak tree. These have quickly become my most favorite of all the cacti around here. It's probably because they are the most dramatic, and we all know I'm a sucker for the drama when it comes to nature. One of the coolest things about these giant plants is that they bloom at night. I have just recently come to find this out now that it's Spring and cacti are sprouting weird nodule out the tops of their heads and arms. In my feeble attempt to find a picture on the interweb of a hammock strung between cacti, I found that the Cactus Hammock is actually a type of butterfly. Learn something new everyday! I've got another week and half left of traveling for work before my summer begins. Sure, I'll be doing work at home, following-up, working on summer projects but I won't be on the road alone. I love traveling, I love seeing new places and finding favorites to revisit in the future. It's just rough being alone so much. I find myself talking to myself even more often than I do when I'm at home and that sort of scares me. I'll be doing quite a bit more traveling this summer though it will be for fun! Two of my bestest girlfriends and I are road-tripping it cross-country for a couple of weeks. We'll be spending most of our time in the Northwest so if ya'll have any suggestions for must-sees, holla at your girl. My violin is cracking. It's so dry out here and my old fiddle is so, well, old. I need to get a little violin humidifier asap. Betcha didn't know there was such thing as a violin humidifier, eh? I'm full of surprises. I betcha also didn't know that I was once in 4-H. 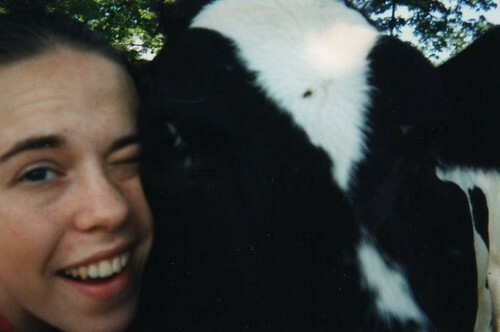 I've been thinking about my experiences on the dairy farm with fondness lately. I miss being so involved with animals. I actually miss mucking stalls and scraping the manure out of my holstein's dirty hooves. I feel so far away from anything living in Scottsdale. It seems like even the people are fake, made of plastic and so far away from the earth it's scarey. Lord, my eyebrows used to look like caterpillars!